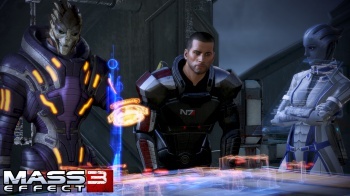 BioWare's upcoming Mass Effect 3 tie-in allows players to save the galaxy on the go. Well, that didn't take long. Less than a week after announcing that a Mass Effect 3 game was inbound for handhelds, BioWare has declassified some relevant details. Mass Effect Infiltrator, a self-described "companion app," is a third-person shooter that will tie into Galaxy at War, the system gauging how ready a player is to face the extragalactic Reaper threat. This iOS game pits players against the forces of the enigmatic Cerberus group, as they face enemies, rescue prisoners, and collect evidence to marshal their forces for the trilogy's final showdown. In addition to the ability to take a part of Mass Effect 3 on the subway, EA promises that Infiltrator will contain "stunning graphics and authentic weapons and powers from the Mass Effect series." As the game will link with a player's EA account, each time he or she completes a mission, his or her Galactic Readiness will increase accordingly. Mass Effect fans may recall that the Galactic Readiness system will determine how Mass Effect 3 ends. Initially, there was some concern that the multiplayer-centric Galaxy at War mode would be necessary to unlock the best ending. BioWare assuaged these concerns by assuring players that multiplayer missions were just one alternative to preparing for the Reaper invasion in single player. With Mass Effect Infiltration, players now have three choices instead of just two. There's no denying that BioWare's past is checkered when it comes to handheld Mass Effect games, but this project seems much more ambitious than Mass Effect Galaxy, which was essentially a three-hour teaser for Mass Effect 2. Infiltrator will release "soon," presumably sometime before Mass Effect 3 hits shelves. The only question now, it seems, is whether the fans decrying multiplayer in any form or the fans clamoring for an Android port will be more upset.